Scents and fragrance not only have a way of bringing back memories, they can also say a lot about your personality. Having experimented with a lot of different types of scents over the past ten years or so, I can probably put my finger on what my favourite scent is and why it’s a representation of me as a person. When it comes to scents, I’m a floral girl through and through. There’s something about florals, the way they look and the way they smell, that has a unique medley of femininity and playfulness. It’s spirited, yet calm. It’s youthful, yet it’s been cultivated. It’s not just about how they smell, it’s also how you respond to the scent - what do you see? What do you feel? If any of you follow me on Instagram, you may know that peonies are my favourite flower - the intensive scent of sweetness is pure delight whilst the density of the petals overlapping is a beautiful visual. These beautiful blossoms are one of the core scents in Gucci’s Flora fragrance which was initially inspired by the signature botanic print by Gucci. This year marks the 50th anniversary of the Flora motif which features intricate flourishes in vibrant colours, and how gorgeous is this limited edition fragrance in honour of the anniversary! I love how the Flora accentuates the peony scent with roses (another one of my favorites) to create a delicate, soft airy feel, harmonized with a rich leathery texture springing from Cedar wood, musk and patchouli base notes. 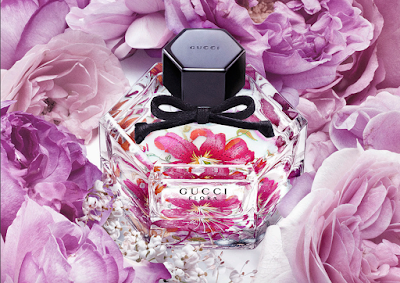 The limited edition packaging makes this perfume a must-have for us floral fanatics too. Taking the same hexagonal shape from the original fragrance, the base is coated with the Flora motif as if they were blossoming from within the bottle - a lovely touch to bring the floral notes to life. *This post is brought to you by Gucci. All opinions are honest and my own.